So I stocked up on dates, and set this pudding in my sights. But somehow the dates in my pantry made their way into cinnamon rolls and warm butter tarts instead, and before I knew it, my best intentions to sample the pudding at the Shakespeare were waylaid by a couple thousand miles when we moved to the West Coast. It wasn’t until this year, when I finally stumbled across Karen Mordechai’s version via Deb Perelman, that I found the chance to mend the error of my ways. This version, granted, got a little confused along the way. 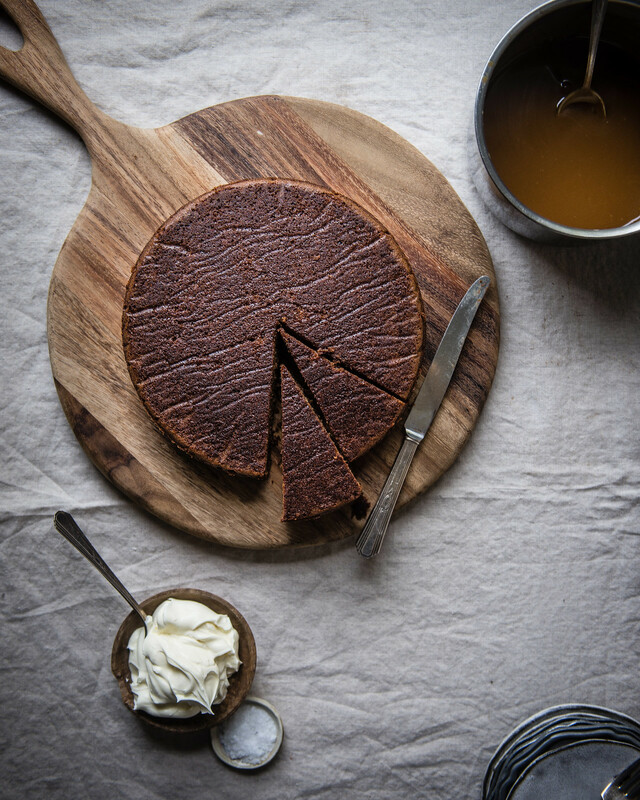 Alongside my sticky toffee preoccupations, I’ve also had a hankering for a good gingerbread–the cake sort instead of the cookie, something like the tall, dark, and handsome one found in Samantha Seneviratne’s The New Sugar and Spice. 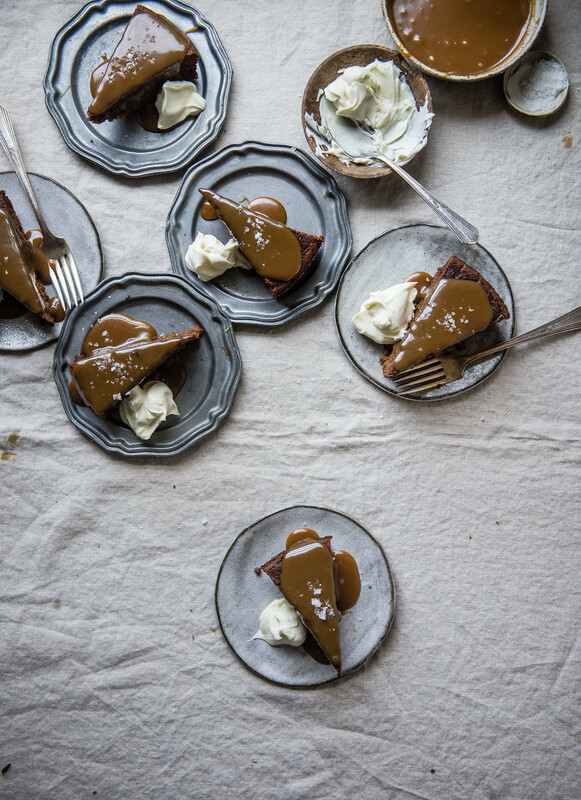 The themes are similar, a sticky, flavorful, holiday-themed cake, but where the caramel-y sweet sticky toffee pudding stops, the gingerbread picks up with warm, dark molasses and spice. 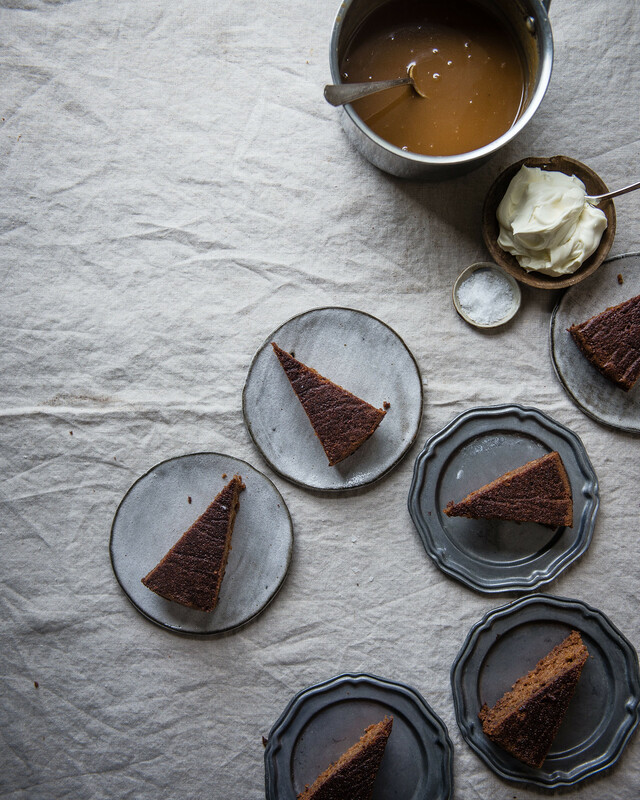 So this has a bit of both: It has plenty of my favorite caramel-like dates, soaked in boiling water until soft and luxurious, but swaps out white sugar for both brown sugar and molasses for a deep, dark flavor and hue. 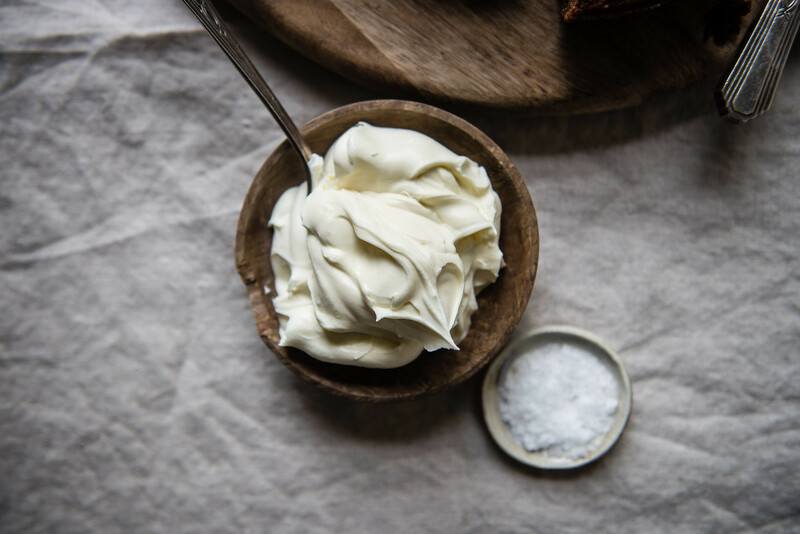 It’s rich and warm and holiday-ready from a happy dose of ground ginger, cinnamon, allspice and more, and cloaked under a butterscotch made with Vermont Creamery mascarpone for even more buttery, creamy redolence than the usual. 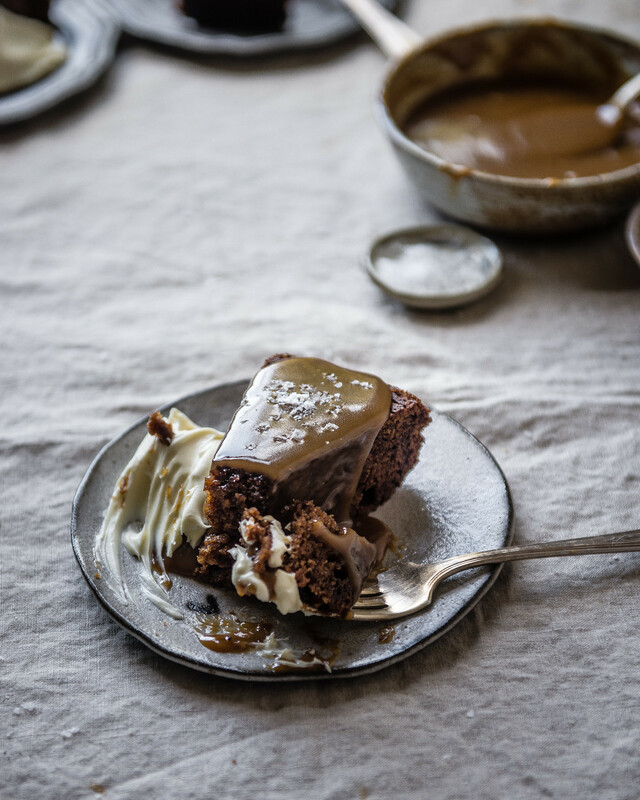 It combines all that I wanted from both warm sticky toffee pudding and dense, rich gingerbread, with the sort of squidgy, comforting excess that is appropriate all of the time but especially at the holidays–because that’s a situation where, in my opinion, you should never have to choose between desserts. I hope there’s as much of this cake, flannel pajamas, and flickering fireplaces in your future as possible. 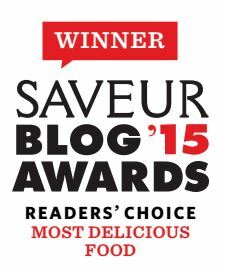 Thanks to Vermont Creamery for sponsoring this post! All opinions are, as usual, my own. 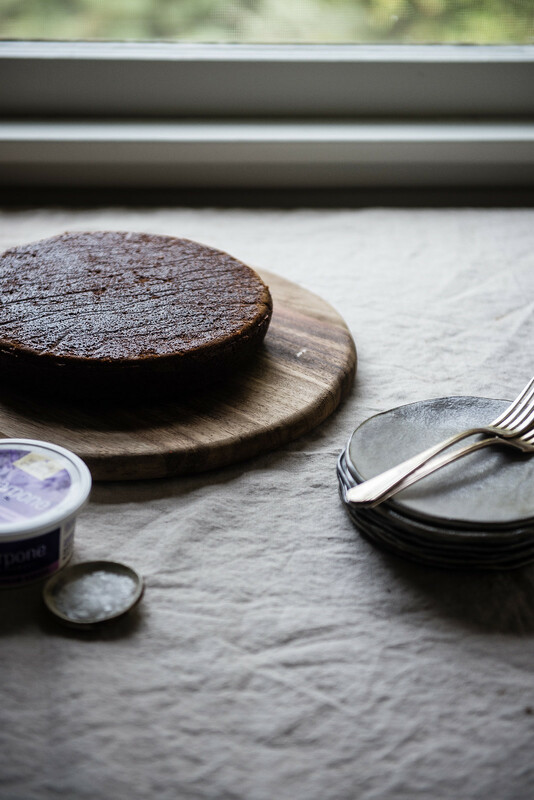 Adapted from Karen Mordechai's warm date cake in Sunday Suppers via Smitten Kitchen and the gingerbread in Samantha Seneviratne's The New Sugar and Spice. Combine the dates and the boiling water in a heatproof bowl and let sit for 30 minutes. Meanwhile, heat the oven to 350°F (175°C) and line a 9-inch round cake pan with parchment paper (or butter it, if you prefer). Blend the date-water mixture in a blender or food processor until smooth. Stir in the baking soda and set aside. 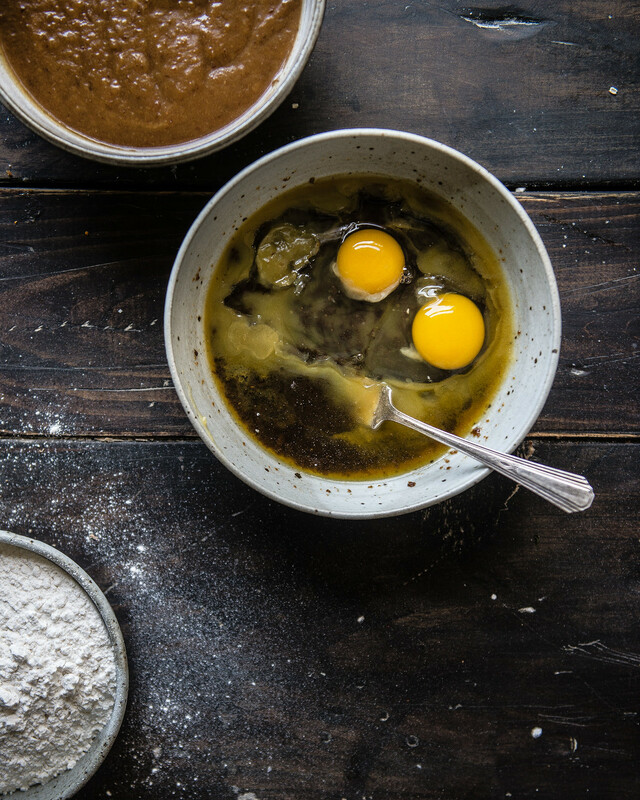 In a large bowl, whisk together the melted butter, brown sugar, and molasses. Whisk in the eggs one at a time. 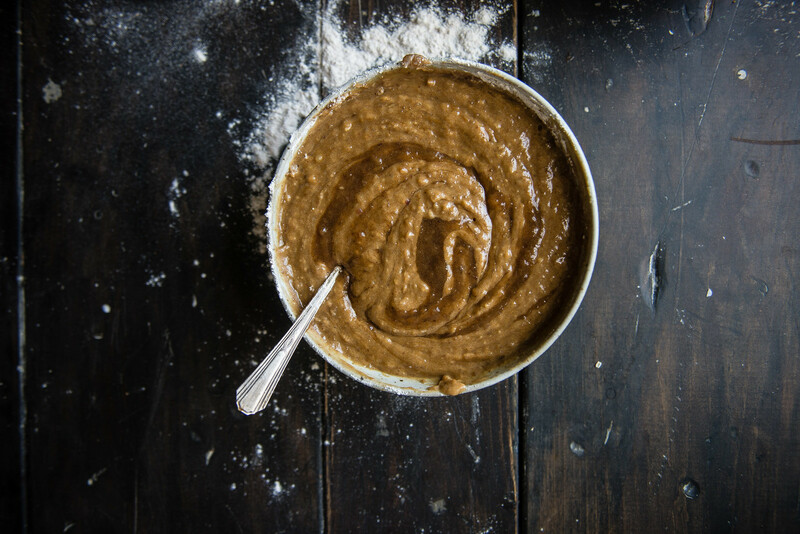 Using a rubber spatula or wooden spoon, gently fold in the flour, then the date puree. Pour the batter into the prepared pan and bake for 50-60 minutes, until a toothpick inserted into the center comes out with just a few crumbs attached. Let the cake cool in the pan for 20 minutes. Meanwhile, make the toffee sauce. Combine the butter, mascarpone, brown sugar and vanilla extract in a 2- or 3-quart saucepan over medium heat. Bring the mixture to a simmer and let cook for about 10-15 minutes, whisking, until the sauce thickens and coats the back of a spoon. Stir in the salt, and set aside. 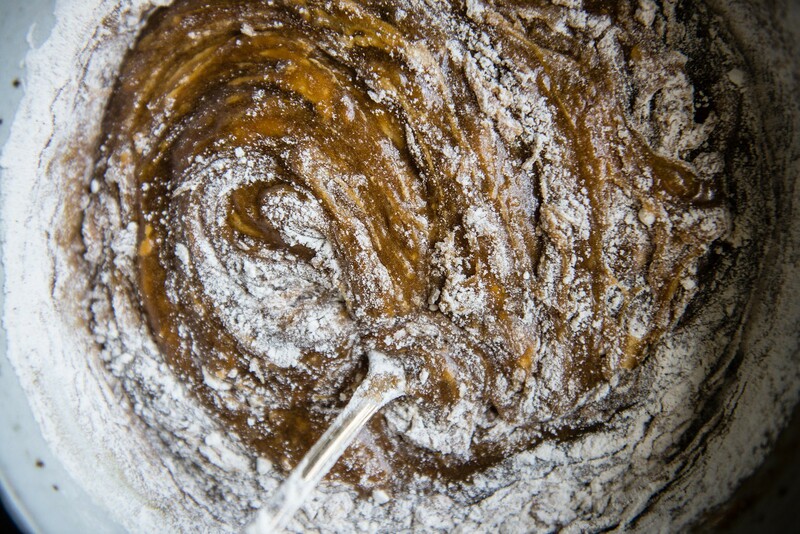 Turn the cake out onto a cooling rack and remove the parchment paper, if using. While the cake is still warm, slice into desired portions and drape each slice with a generous amount of toffee sauce and a pinch of coarse sea salt, plus more mascarpone or whipped cream if desired. Enjoy! For a cake that veers even more into that warm, rich holiday gingerbread territory, use the higher range of the spices listed below. You could even stir in a teaspoon or two of freshly grated ginger. « halloweens and first birthdays! This dessert speaks to me on sooooo many levels; totally dying at that pic of the cake slices smothered in that ooey-gooey decadently divine toffee sauce! If I could reach through the screen and grab the whole cake (and bowl of sauce) I so totally would 😛 I’ve yet to try my hand at a dessert incorporating dates, but I think you may have just changed that. I am such a sucker for gingerbread cake, and just hearing you utter the words was enough to send my taste buds into a desperate frenzy. Definitely bookmarking this! This looks so, so good!!! Omg that sauce! And that cream!! I am in love. this is my kind of decadence! looks amazing, i have to try this! Love your version, will be trying it though in Miami there are no flannel PJ’s or fireplaces for me till our family ski trip to Telluride in the spring. I usually serve my Sticky Toffee pudding with a really good quality vanilla ice cream that I’ve left out so it will pour out of a pitcher, people always think I’ve made a luxurious vanilla sauce! Looking forward to trying it with the marscapone. so glad you posted this, even after moving to the other side of the country from it’s source! Mascarpone is such a nice flavor and one I only use rarely for some reason, this recipe at least gives me a great opportunity, thank you for this recipe! OMG – this sounds sooo delish! 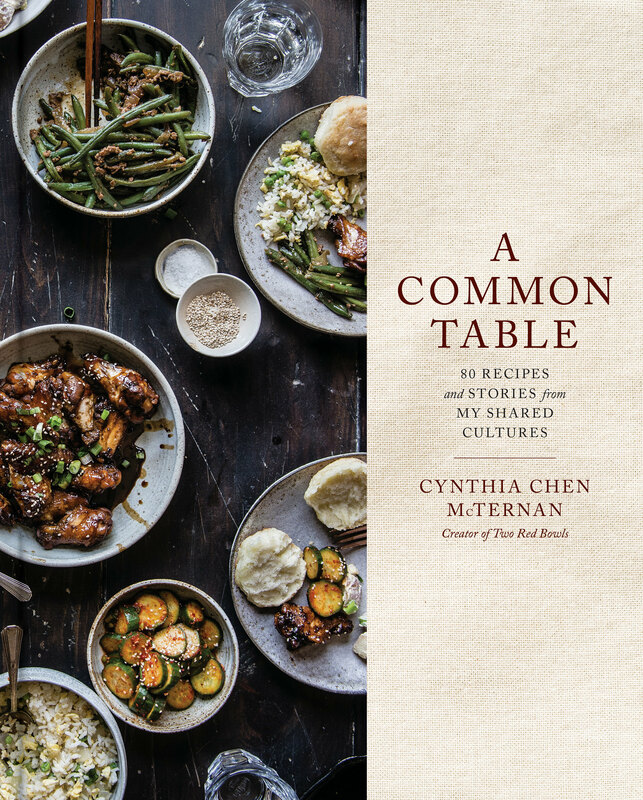 I’d love to serve it to my book club this month. Any hints for making it a few days in advance and re-warmed for serving? Hi Lee Ann, you could totally make it ahead! I would make just the cake, let it cool completely, then wrap really well in plastic wrap and foil, and freeze. Then I’d let it thaw (still wrapped) at room temperature the day of, and make the butterscotch just before serving. 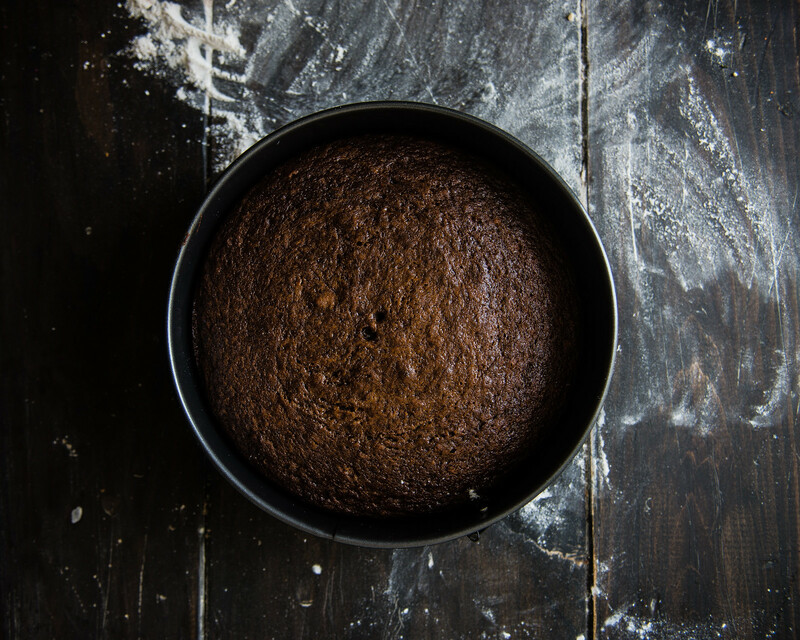 If you want the cake warm, I’m sure you could pop it into the oven for a few minutes once thawed or microwave just before serving. I’d love to hear how this turns out if you try it! Thank you for stopping by! Your photos are swoon worthy! This was delicious!! A big hit with my family for Christmas and easy to make. Thank you for the delicious recipe! That absolutely makes my day! Thank you so much for trying it and for the kind words, and a belated merry Christmas!